More and more people are living in one person households. Credit: Rebecca Murray/IPS. UNITED NATIONS, Feb 22 (IPS) - A significant global demographic change having far-reaching consequences yet receiving scant attention is the rise of one-person households. Of the world's two billion households, approximately 15 percent - or 300 million - are one-person households (OPHs). As is often the case with global averages, considerable variation exists in the incidence of OPHs across countries. The highest rates of one-person households occur in Europe (Figure 1). Among European countries OPHs of 40 percent or more are reported in Denmark, Finland, Germany and Norway. 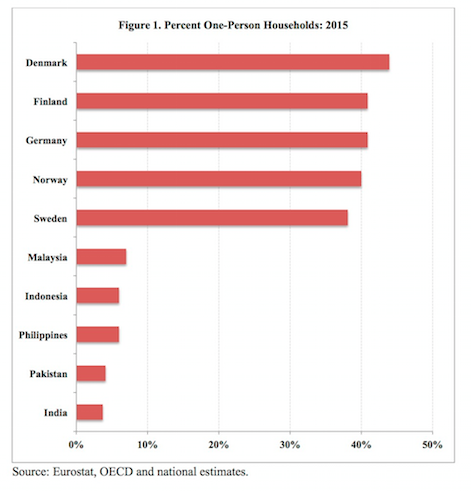 Other European countries with high rates of one-person households include Sweden (38 percent), Austria (37 percent), Switzerland (37 percent) Netherlands (36 percent), France (35 percent) and Italy (33 percent). Moderately high levels of one-person households are also observed in countries outside Europe, such as Japan (32 percent), the United States (28 percent), Canada (28 percent), South Korea (27 percent), Australia (24 percent) and New Zealand (24 percent). One notably lower proportion of OPHs among developed countries is Russia (19 percent). Developing countries generally have lower proportions of one-person households than developed countries. Some of the lowest rates of OPHs - less than 10 percent - are observed in India, Indonesia, Iran, Mexico, the Philippines and Vietnam. Other developing countries having levels of one-person households closer to the global average include China (15 percent), Turkey (13 percent) and Singapore (12 percent). Although China's proportion of 15 percent OPHs is well below the levels of developed countries, China has the world's largest number of one-person households - 66 million are registered - due to its enormous population size of 1.4 billion people. In second place with an OPH proportion of 28 percent is the United States having approximately 35 million one-person households. The proportion of people who live alone has grown steadily over the recent past. Since the 1960s, for example, one-person households in many countries have increased substantially (Figure 2). 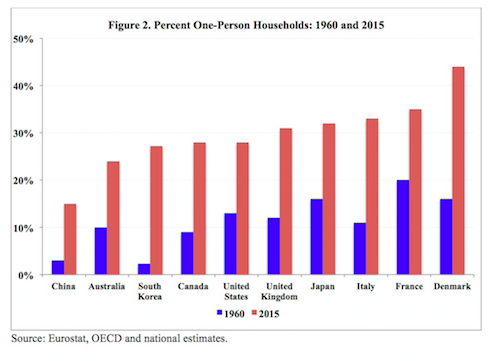 In many European countries as well as in Australia, Canada, China, Japan, South Korea, and the United States, the proportion of one-person households has more than doubled. Also in contrast to the recent past, in at least 25 developed countries one-person households have become more numerous than two-parent households with children (Figure 3). 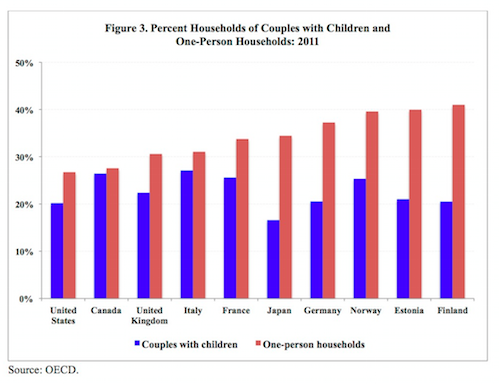 In several of those countries, such as Estonia, Finland, Germany and Japan, the proportion of one-person households has reached approximately twice that of couple households with children. Various factors account for the rapid rise in one-person households. Economic development, increasing wealth and improved standards of living play major roles in the increased incidence of OPHs. Consequently, the levels of one-person households tend to be substantially higher in developed countries than in developing countries. With greater affluence people can afford to live alone and growing numbers are choosing to pay for their personal privacy, individualism and freedom to live as they wish. Also, as women have become more socially and economically self-reliant, they are more able and apt to establish one-person households. With increased education, more employment and career opportunities and improved gender equality, women are increasingly able to choose their life styles, including whether they would like to live independently on their own. Population ageing, increased longevity and improved health at older ages are also important factors giving rise to one-person households. With longer, healthier lives and the growing proportions of elderly persons, widows and widowers are often choosing to live alone, especially in developed countries where governments generally provide old age social security, assistance and health care. Urbanisation with its high population densities, small living quarters and multitude of services, opportunities and freedoms permits a lifestyle that is conducive to living on one's own. Whereas in 1960 two-thirds of the world's population lived in rural areas, today the majority of the world's population (55 percent) lives in urban centers. In addition, the migration of the young single men and women from rural areas to urban centers often results with the elderly living alone and far away from family members. Another major reason for the rapid rise in one-person households among young people is delaying or eschewing marriage and family building due to higher education, professional training, career aspirations and personal goals. In addition to lower marriage rates and smaller family size, growing numbers are choosing to remain childless. Also contributing to the rise in one-person households are high levels of divorce and cohabitation dissolution, low rates of remarriage and changes in traditional values and family structures. The divorce rate in China, for example, has increased rapidly during the past thirty years, jumping from 0.4 divorces per 1,000 people in the mid-1980s to 2.7 divorces per 1,000 people today. Similarly among OECD countries, the average divorce rate increased from 1.3 divorces per 1,000 people in 1970 to 2.1 divorces per 1,000 people in 2014. Modern communications, particularly the Internet, allows those wishing to live alone to be connected and engaged with family, friends and others. As often noted, living alone does not necessarily mean one is lonely. Relatively low cost, modern communications and social media have permitted one-person households to maintain intimate relationships, friendships, emotional support and social interactions. The rise of one-person households has consequences for consumption patterns, resource allocations and human mobility. The growing numbers of OPHs increase demand for housing, transportation, natural resources and energy. In addition, one-person households have implications for certain industries and businesses, such as housing,appliances, electronics, domestic goods, health care, food manufacturing, meal packaging, financial and personal counseling, travel, entertainment and home services. Also, the growth of OPHs has various societal and normative implications, including the well being of the individuals residing on their own. One-person households tend to be more vulnerable and therefore potentially more costly to society than those having a partner or companion. With a single and often limited source of income, one-person households are more precarious with lower median household incomes and generally face more difficulties when dealing with unemployment, injury, illness, adversity, disability, social isolation and loneliness. In addition, the increase in one-person households has government policy implications. OPHs often mean smaller savings for retirement and therefore potentially greater financial aid and assistance needed for the elderly in the future. Voting patterns are also likely to be impacted, with astute political leaders realizing that perhaps its time to expand their traditional focus on what is good for families with children to the needs of people living alone. Clearly, the rise of one-person households is a significant global demographic transformation with wide-ranging consequences. For individuals OPHs offer opportunities for men and women wishing to have privacy, solitude, introspection and personal lifestyle choices. 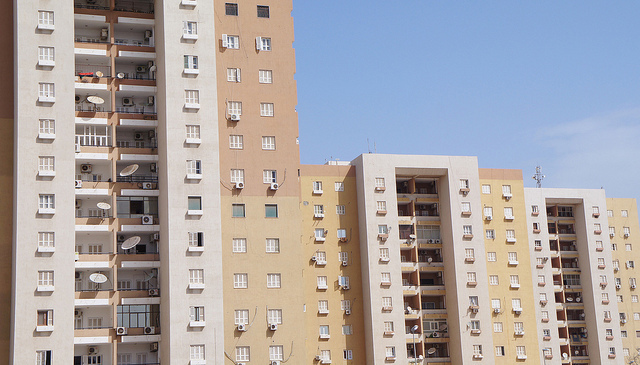 However, growing numbers of one-person households also pose challenges to the social and economic development of urban centers and rural areas, the centrality of the family in modern society and the capacities of governments to provide support, services and care to those living alone when needed, particularly the elderly. Effectively addressing those and related challenges requires acknowledging, discussing and planning for the large and growing presence of one-person households.